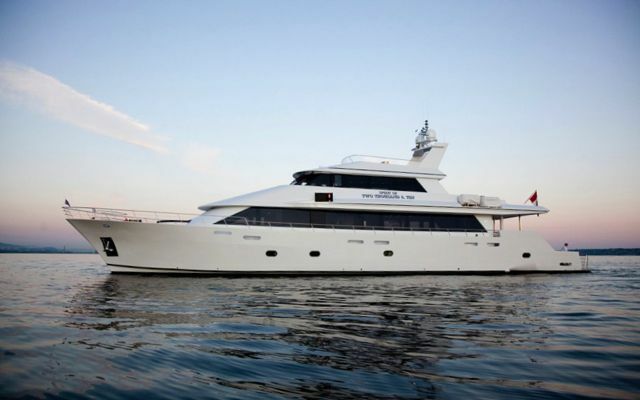 The Spirit of Two Thousand Ten is available for harbor cruises, day trips, week long charters or multi-week adventures. 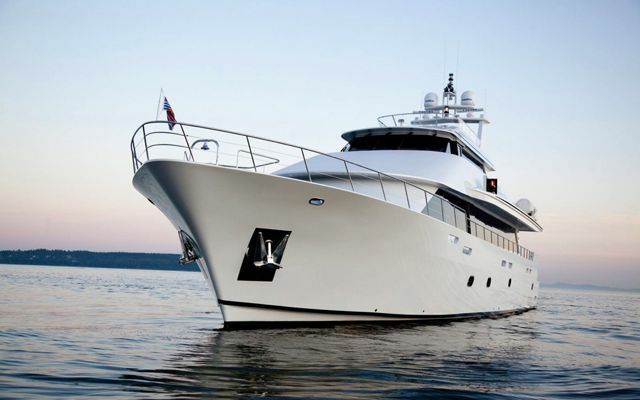 The Spirit can host up to 70 guests for short charters and 10 to 12 overnight. Whether it’s business or pleasure, for an evening or a week-long charter, the Spirit and our impeccable crew will be sure to impress — and make memories that will last a lifetime. The Spirit offers the comforts and luxury of a five-star hotel and Mexico’s fine dining at its best, all while enjoying the natural vistas of the region’s magnificent coastlines. There is nothing more enjoyable and exhilarating than cruising along a beautiful coastline aboard your own chartered luxury mega-yacht. You decide when to sail, swim, collect shellfish, or just relax on deck. The Spirit of Two Thousand & Ten is at your service, and our captain, crew and support staff would be delighted to help you plan your dream itinerary. Whether you’re looking for a night on Baja’s spectacular waterfront, a business retreat away from the bustle of the city, a week long charter to explore the Sea of Cortez, head up to Alaska, or down to South America, we’d be happy to set you on your way. The Spirit’s interiors are beautifully designed and built with skilled craftsmanship. Unique features include rich, dark Makore wood finishing throughout, teak floors, granite countertops, and state of the art furnishings and fixtures. 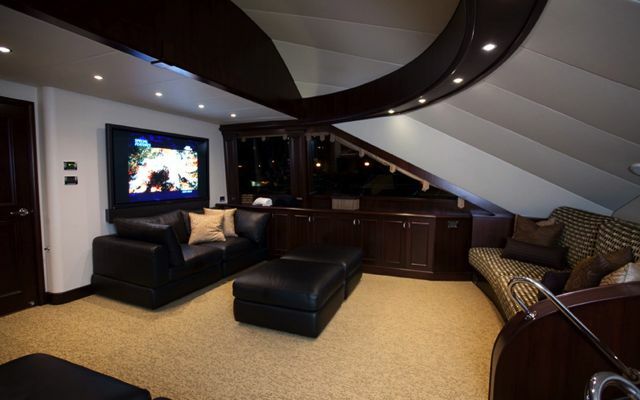 Our engine room and interiors are expertly engineered to reduce noise and enhance privacy. The master stateroom features an elegant queen-sized bed surrounded by ornate wood features. Two eloquently designed heads (washrooms) provide the choice of a shower or steam spa for two. At mid-ship, four beautifully-appointed guest staterooms feature queen-sized beds and private heads (washrooms) with shower in each cabin. Custom-polished stainless steel port lights allow for enjoying the passing views. The Spirit’s main lounge provides an excellent socializing area, designed with a comfortable grouping of sofas and tables. Off the main lounge is a 12-seat dining area featuring a large, custom teak table. This area can be used for formal or casual dining, hospitality snacks during a large social event, or a work area for business meetings. Forward of the salon, and seamlessly connected, is a full-service bar with granite countertops and eight permanently-stationed, swivel-backed stools. The commercially equipped galley is partly open to the salon. In the center of the galley is a workstation island, where our chef demonstrates, with flair, the skills of West Coast cuisine. 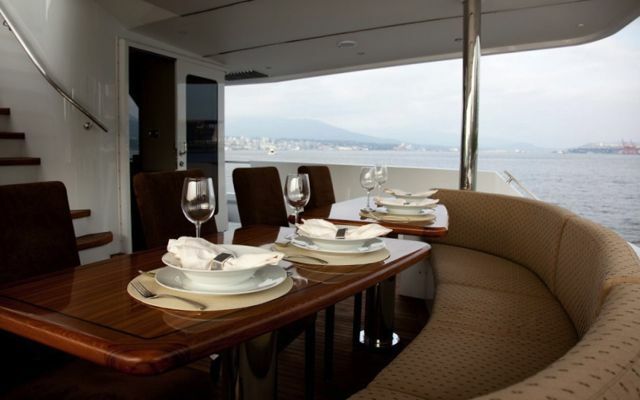 An intimate dining and seating area is located on the far side of the galley. Past the galley is a versatile entertainment or multi-purpose room, with a sloping semi-circular feel. This area features custom-built couches, a gorgeous sound system, and a 65-inch flat screen panel. This room can also be converted to a formal dining area. The aft deck exterior lounge on the main level of the Spirit provides comfortable seating and tables for guests, served by an outdoor bar. On the main level, just off the forward lounge, you’ll find the Spirit’s custom outdoor hot tub: 900 gallons, adjusted to your liking, to soak and enjoy the view. Up the beautiful winding staircase from the main salon, the beautifully-designed interior sky lounge features large windows for enjoying the beautiful West Coast. Another versatile space, the Sky Lounge can be used as a casual area for enjoying the multi-media entertainment center and 60” flat screen, a socializing and entertaining area, or converted to a conference/meeting room. On the Spirit’s fourth level, the top deck, an exterior lounge features built-in settees and sun chairs, providing magnificent views to enjoy while you cruise. 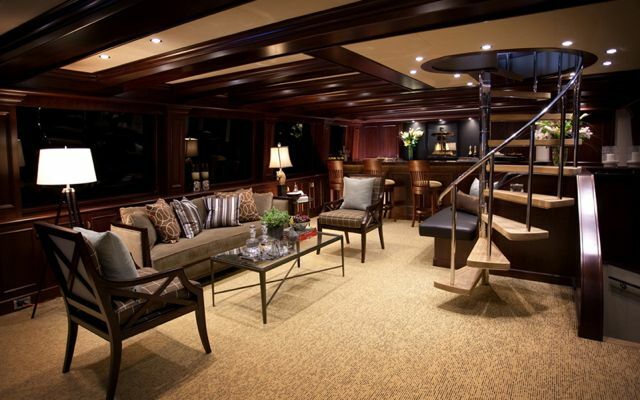 On the top deck, adjacent to the outdoor lounge, the pilothouse is designed to invite guests to experience the operation of the vessel while still separate and removed from interfering with the business at hand. The vessel is equipped with state of the art engineering and equipment for safe cruising to any coastal cruising grounds. 50% deposit is required upon booking outside of 30 days to charter. The balance owed can be made with cash upon the day of charter. Deposits are refundable outside of 30 days to charter. If the charter date is within 30 days of booking, payment in full is required and is transferrable upon cancellation however, no refunds shall be given. » Weddings, anniversaries or birthday parties. » Corporate meetings, executive team building, or presentations and seminars. » Cocktail parties, hosted dinners, or wine tasting events.